It is a Brunswick Barrington. 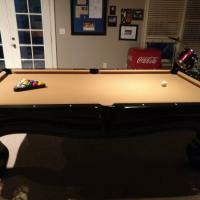 The dimensions are 54.25"x99"x32.5" The table is in great shape. Moving arrangements are buyers responsibility.